Petrochemical-based polystyrene foam is everywhere, and used for many different applications. It’s hard to imagine something replacing it, but in the very near future we might see wood-based foam become the norm. Environmentally-friendly, wood-based foam is poised to be used for many of the different applications that polystyrene-based foam is being used for, namely thermal insulation, sound absorption and packaging. Wood foam is very sustainable because it consists entirely of wood fibres, without any additives like resins, binders or glue involved. Its strength comes from the wood fibre’s own bonding forces. So, it is very ecologically-friendly. It’s also a renewable resource. The wood used can come from anything from large trees to small-twigs. It can even be sourced from fibrous agricultural waste. And precisely because it’s wood-based, it is very recyclable. Packing material made from wood foam can be discarded via the paper recycling bin. Wood foam is being pioneered by Fraunhofer Institute for Wood Research in Braunschweig, Germany, which first came out with a product in 20014. But early attempts at making wood-based foam goes far back, more than 10 years earlier, in 2003, when researchers in Austria decided to mix sawdust with wheat flour and water to form a dough. The end product, which was produced by literally baking the dough, was called “Wooden Bread” and it was intended to be used for industrial purposes like how wood foam is intended to be. There was considerable pushback by critics who say that wheat should be used for food not for industrial purposes. That project eventually died a natural death. Wood foam is unlikely to suffer from similar criticism as it does not involve foodstuff such as wheat but merely wood fibre. 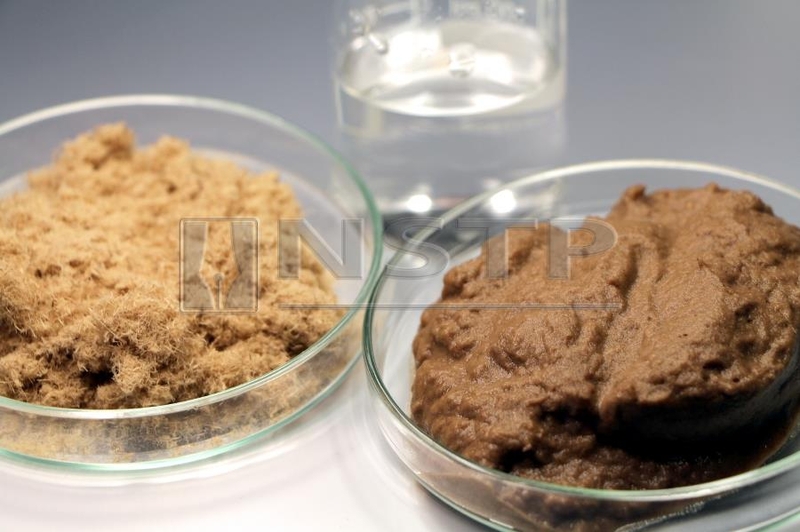 The source material can be hard or soft wood or even agricultural wastes. Raw materials for wood foam. In the laboratory, beech and pine wood have been used to make the prototypes. Wood chips are ground very finely and mixed with water. Air is then blown through it to create the foamy texture. As mentioned earlier, no resin or glue is used. The strength of the wood foam is mainly due to the binding forces of the wood fibres themselves as they harden. But introducing hydrogen peroxide will help to hold the structure together. The strength of the foam will vary according to the density of the foam. The closer the fibres are to one another, the stronger the foam will be. Fibre length also affects strength. Pine foam, with its longer fibres, consistently outperforms beech foam in strength. For fire safety, additives must be added during the manufacturing process by mixing them with the fibre materials. 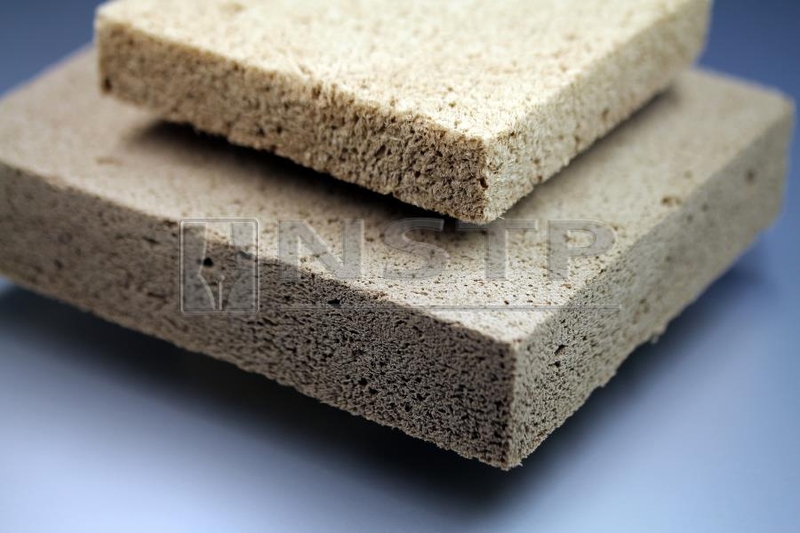 Wood foam has already been tested according to relevant insulation standards and promising results were achieved in terms of heat-insulation and physical properties. But wood foam is going to get even better with the introduction of metal into the mix. That’s what Fraunhofer Institute for Wood Research and Wilhelm-Klauditz-Institut WKI have been working on. Their project, “HoMe Foam” (HoMe is the German acronym for wood-metal) aims to combine the properties of both wood foam and metal sponge. The end result is a foam with bending strength that is greater than either of its components. The process of making HoMe is more complicated than just mixing wood and metal into a bowl and mixing them up. The metal component is not foamed but is created through a casting process that creates a sponge-like, open-cell metal structure with many small holes in it. The wood foam is then inserted into the metal sponge. 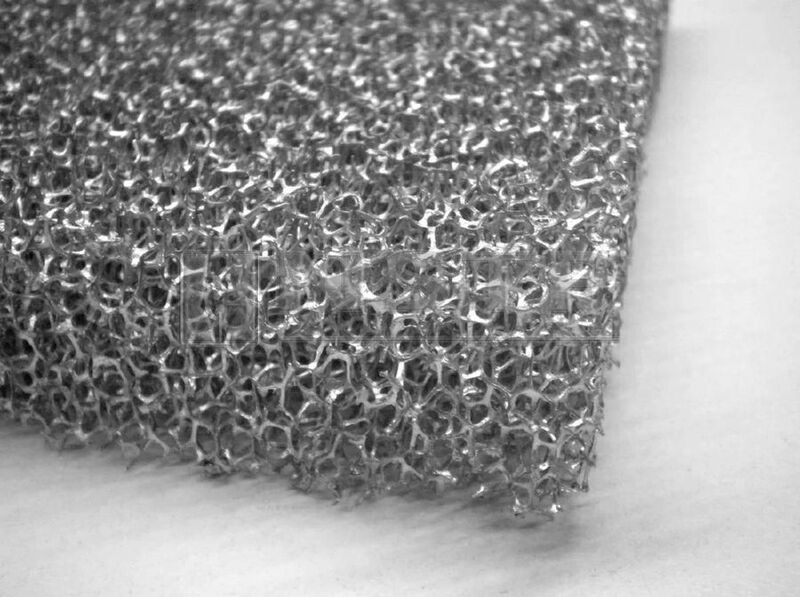 Close up view of metal sponge. 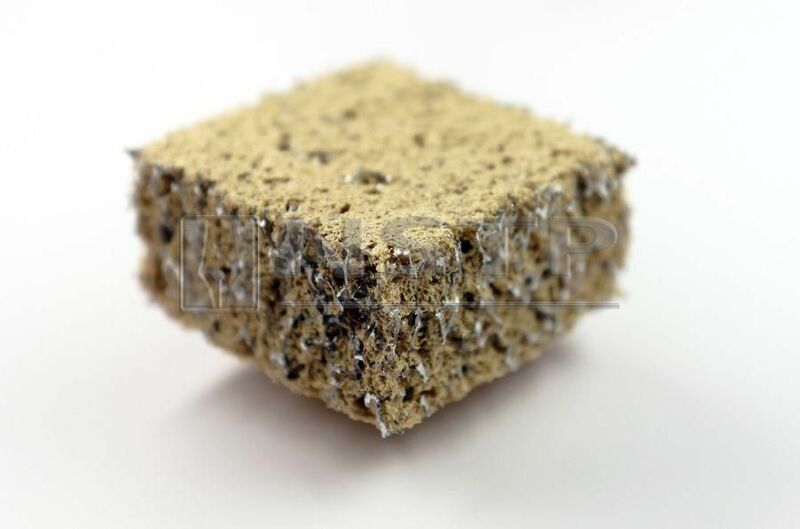 Originally, the scientists tried using pressure to force the wood foam into the metal sponge plate but the wood fibres coated the surface of the sponge rather than seep into it. They ended up using a mechanical tapping technique that was able to fill the entire sponge with wood foam. It was then left to dry. The resulting wood-metal composite foam has all the thermal and acoustic insulation properties of the wood foam, but that has much higher bending strength than either the wood foam or the metal sponges alone. It also has the added functionality of electrical conductivity. Although wood-metal foam is not commercially available yet, it has great potential for the future because of the many environmental and economic advantages that it has over polystyrene foam.